Highlighter is a custom column for use with all editions of SharePoint 2007, 2010, 2013 and 2016. Select the Highlighter button to install. 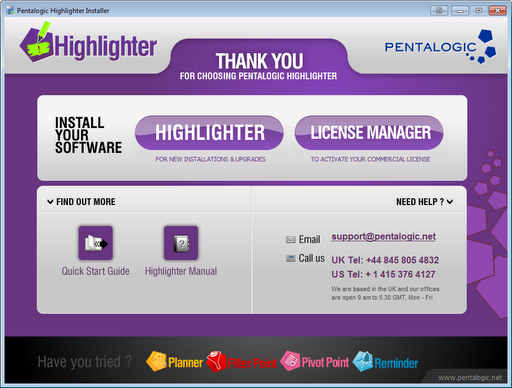 You may wish to also install the License Manager at the same time. The automatic installer will verify some prerequisites (such as the SharePoint administration service is running) and if everything is ok will Install and Deploy the web part to all Web Front End servers in your farm. Highlighter is a Custom Column and Custom Columns are classed as Farm Solutions in SharePoint. So if you want to check that Highlighter has been installed and deployed look under: System Settings > Farm Management > Manage Farm Solutions. 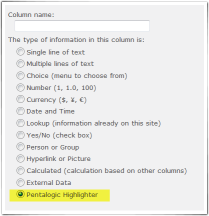 If you see it there marked as deployed, then when you create a new column on a list you will get the option of setting the type to Pentalogic Highlighter. 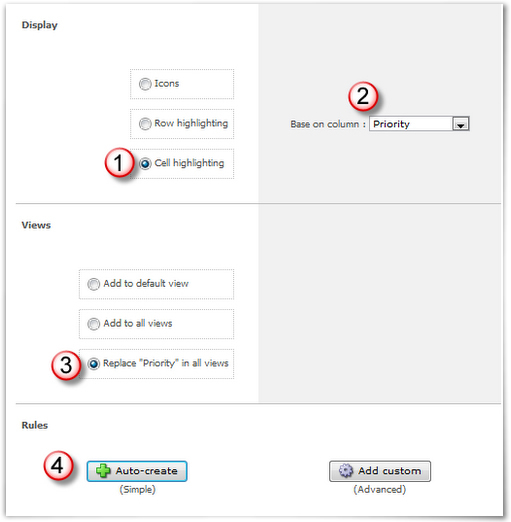 TIP - When you add a new Highlighter column remember that each column in a SharePoint list must have a unique name, so even if your Highlighter column is intended to replace an existing column (eg "Priority") you will need to give it a different name (eg. "Task Priority"). Highlighting – lets you highlight the text or background of a row or cell in different colours, or add icons from the supplied library, or of your own choosing. Progress bar – lets you show progress towards a target, due date, or visualize a percentage column. You can color code your progress bars if you wish. Countdown – lets you show the time difference between 2 columns, or between 1 column and today. Again, color coding can be applied. The Rules are how Highlighter tells the list how to behave. If you want to keep things simple, for highlighting, icons, progress bars or countdowns you can simply allow Highlighter to "auto create" setting things up in the most obvious way. Alternatively, you can choose to use the Advanced rules, and set things up yourself, from scratch. You will see that even if you choose to "Auto-Create" the rules, you can still edit them if you wish – for example if you think Highlighter has chosen and offensive color scheme you can change it! 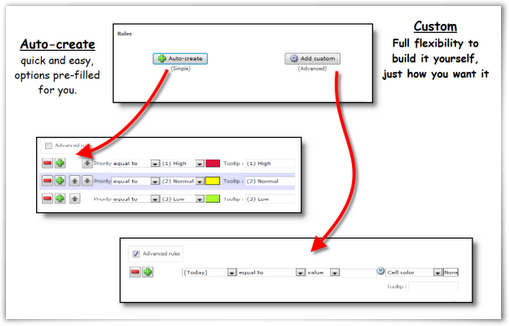 You may find that going with the "Auto-Create" settings then editing them, is the best way to learn how the rules work. You can use color in either the cell/row background, or text. For this example we are going to highlight a cell. Here the rules are all set up for you, so you can just click OK and you’re done. You can see we have lots of options here, but for now just change the row highlighting to text color, which should be a bit less offensive to look at. TIP – though you can use the advanced rules to set up more than one feature using just one Highlighter column you can add as many SharePoint Highlighter columns to one list as you want. This should be enough to get you started and the principles for adding icons, progress bars and countdowns are very similar.